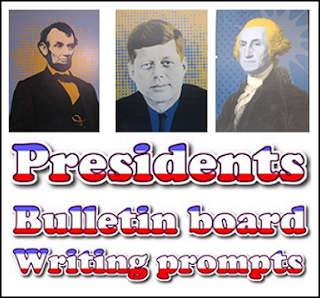 Freebie: Celebrate the presidents of the United States with these 4 writing prompts and quick edits. File contains 4.PDFs containing a photograph and quote by Presidents Carter, Kennedy and J. Q. Adams. These are just 4 of a set of 51 available for purchase. Photographs included were taken at a display near the Washington Mall. Several presidents are featured twice. Suggestions: Post the quick edits over the corresponding writing prompt so students can flip the edit sheet up to see the properly written quotation. Choose a few to set up as an anchor activity or a gallery walk or as stations and have students rotate through. Can be used as a game by covering the picture and name and having students guess who said the quote. Laminate for use year after year.